Let's say we have an app written in Python to be run on Google App Engine, and we want to write unit tests for it. ...or, wait. 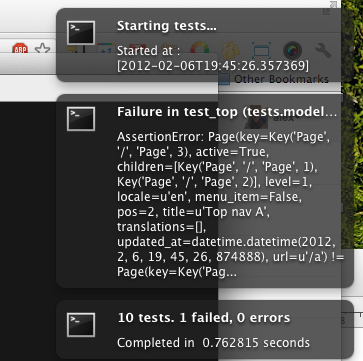 Let's even say we don't have an app (yet) and we want to start from writing the tests (AKA TDD). nosy or tdaemon - a tiny little program that would run in the background, run your tests as soon as one of the source files changes and notify you about tests results using Growl. First, make sure you have Growl installed and running. or if you prefer tdaemon, replace "nosy" above with "tdaemon". I'm going to show you both in a bit. If "pip" gives you "command not found", replace it with "easy_install", or install pip python package with "easy_install pip" and then execute the above again. A side note: why snort and not nose-growl? Well, it's been a nice plugin for Nose but it looks like the latest Mac OS, Lion, and the plugin doesn't play nice together. In fact, there's a blog post describing the setup in details. I couldn't make it work with Mac OS Lion though. So, yeah, I'm using Mac OS here but this should work for a linux distribution too. Not sure about MS Windows. You should be able to see a notification saying "test". - that means Growl and growlnotify are installed and working properly. Almost done. All we need to do now is connect nosetests results that were displayed in the terminal earlier with growlnotify (1) and make it go over and over again whenever a source file of the app is changed, i.e. we want to make it listen to the filesystem changes (2) related to our application directory. The (1) is pretty easy: add "--with-snort" option to "nosetests" command, e.g. right before "--with-gae". That's what we installed snort package for at the beginning. Now, to make it watch filesystem changes (2), there are two options (at least, the options I want to show in this post) - nosy or tdaemon. They are pretty similar in the functionality. Here's how to make nosy work. I like putting all the testing stuff in a "./tests" subdirectory, so I placed it in ./tests/nosy.cfg. You should probably replace tests/nosy.cfg with the correct path to your nosy.cfg file we've just created. That's it. Make sure you have all tests pass (or fail, on purpose :) as you keep on writing the code. There's no really need for a config file (e.g. a nosy.cfg) to make tdaemon work. tdaemon --custom-args="--with-snort --with-gae --without-sandbox --logging-filter=-root"
and it'll do the same effect like "nosy -c tests/nosy.cfg". This is interesting, I'm using Nose and GAE but I've never seen growlnotify :). I'll definitely give it a try!